I could hear music coming from the living room, and I knew that was my cue. I put on my twirly nightgown and I ran to my place in front of the piano. The scene was familiar--my dad was seated on the bench, his long legs reaching the pedals with ease and his hands flying across the keyboard striking chord after chord. I loved watching him play. He had played the same songs for so many years that rarely did he open a book. Rather, he would recount from memory as many bars as he could remember, then he would hesitate for a second before asking no one in particular, "What about this one?" and off he'd go on the next adventure. His music of choice was usually upbeat--John Phillip Sousa's "Stars and Stripes Forever," or the march from "Aida," or even a little Scott Joplin. But my favorites were always the lesser known marches of E.T. Paull--"The Burning of Rome," or "Ben Hur," or my very favorite--"Napoleon's Last Charge." I would spin and spin and dance as the music got louder, faster, almost frenetic in its pace as it built to its inevitable conclusion of dramatic chords and crescendo. I would then collapse in a heap, exhausted and happy, and then beg for another, to which he would almost always agree. I made a vow, then and there as a small girl, that one day I would play those songs and bring that excitement to others, just the way my dad had brought it to me. I was a young mother. I could hear music coming from the basement, and my kids knew that was their cue. 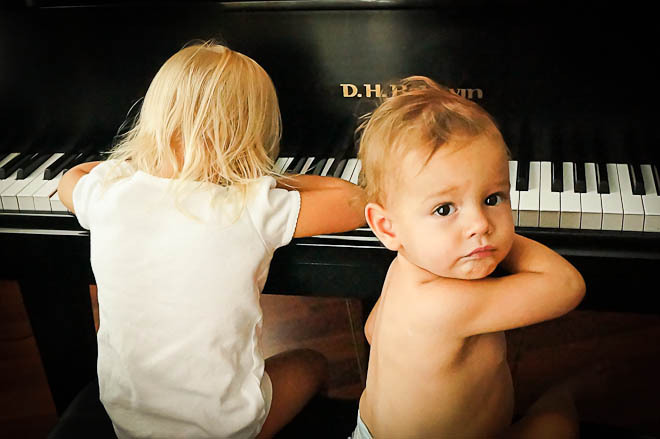 There was Grandpa, seated at the piano, with young grandkids all around him, dancing to the crazy exciting bars of E.T. Paull. They were laughing and spinning and dancing and begging for more and more, just as I had done twenty years before. Dad's ability to play had been hampered by age and by a severe break of his thumb in a horse accident, so maybe he couldn't play quite as fast or remember quite as many bars in a row, but it didn't diminish the joy I saw in the basement that day, and on many days to come. 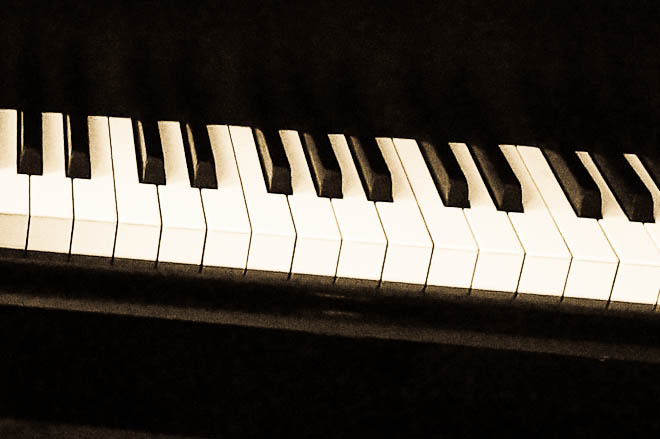 I seated myself at the piano, curled my left foot under the bench and placed my right foot on the worn brass pedal. I opened my music to page 116--no matter how many years it's been since I learned to play E.T. Paull, I still need my music to enjoy the entire piece. My hands found the familiar B flat chord as I called my youngest daughter and my oldest granddaughter to the living room. The music started, and a smile spread across Ellie's face. She started moving, first lifting her shoulder up and down in her signature dance move, then, unable to keep the beat from influencing the rest of her, she began marching and running in circles around the ottoman. Evie joined behind her, stopping occasionally to wiggle her body or clap her hands. The music got faster and louder and the girls kept pace as best they could with their little toddler legs. 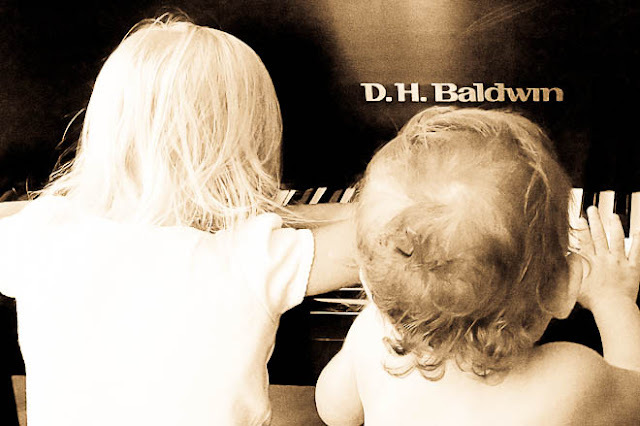 As the last chord died away, I turned to look at my two little girls, and I realized in that moment that life had come full circle, and I had fulfilled my vow. With us it's about music too - the old songs, the lullabies, the 'car' songs. Okay, that made me cry. PS. Funny, I used to stretch out under the piano to listen to my sister play...and also, when my mom practiced her violin, which she always did near the piano. I loved it under there. I had no idea that your dad plays piano. That's awesome. Love that guy. What a sweet memory....you have come full cirlce for sure. Your dad will love this post. I love the pictures. What a couple of cute girls!